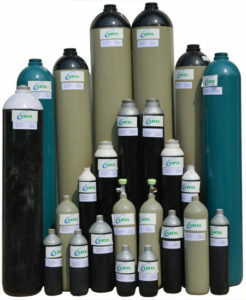 We are a renowned Nitrous Oxide gas dealers and suppliers in India. This Nitrous Oxide gas is also referred as Laughing gas. It is basically colorless, liquefied and non flammable gas. Nitrous oxide is generated by decomposition of Ammonium Nitrate in a closed chamber. During this process, Ammonium Nitrate is heated at a very high temperature and gets breaks up in Nitrous Oxide and water vapor. Though undesirable, but still due to its low cost of production, some developing as well as under developed countries allow use of Nitrous oxide as an Anesthesia Agent in medical field. Nitrous oxide is a green house gas and sometimes referred as Air Pollutant. Because of this nature of Nitrous oxide, now a days various sanctions are imposed on its use. Nitrous oxide generates Nitric Oxide, which in turn is not good for Ozone layer and depletes the same. This is the main reason, use of Nitrous oxide getting undesirable day by day. Majorly in medical field as an anesthetic Gas. As a rocket fuel propellant. These are some of the common uses of Nitrous Oxide. There are various other ways in which Nitrous Oxide can be used in a particular industry or process.